Doctor, and Society. The contributions, from nationally respected practitioners, delve into the many aspects of doctors' interactions with the world around them, and include discussions on: -Becoming a physician, with attention paid to the effects of the demanding educational/training process of the individual student; -Basic clinical skills such as interviewing, physical examination, laboratory testing, diagnosis, and accurate record keeping; -New approaches to improve decision making, patient education and negotiation, chronic illness management, counseling for behavior change, and functional status assessment; and -The cultural world of the patient, including the varied issues that make each patient a unique case. Case studies are also included which vividly bring to life these concepts, and recommendations for further reading are offered. 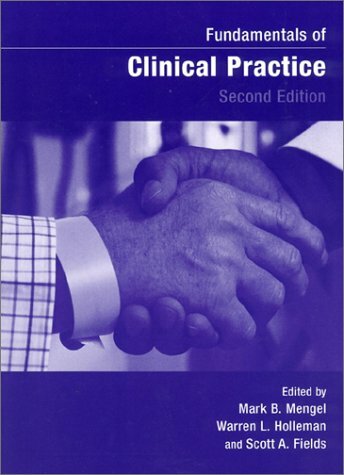 Fundamentals of Clinical Practice, Second Edition presents medical students with a comprehensive guide to the social ramifications of a physician's work, and more experienced practitioners with the tools to augment their own patient-centered techniques.